If you’re looking for driving lessons in Pudsey, Online School of Motoring can promise that we will go the extra mile to ensure that you can past your test first time. All of our instructors are highly qualified and experienced to help you get the best out of learning to drive. OSM is a family run driving school with over 10 years experience. All of our driving instructors take pride in the service they offer. For those on a tight schedule, we provide intensive courses and we also offer extra one to one tuition for theory tests for those who need a little extra help. We make sure that all of driving instructors provide the best service when you are learning to drive. They understand that everyone learns differently and can tailor the lessons to a learning pace that suits you. With OSM you will never feel rushed and we will always do our best to make you feel comfortable and confident in your own driving. When learning to drive, our instructors will always be patient and understanding. 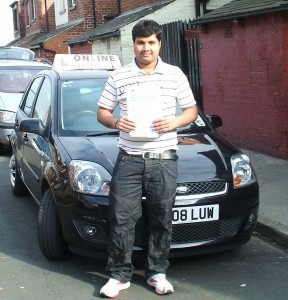 Our aim is make sure that you are comfortable, understand what you are learning and pass your test first time. If you feel that you ever need any extra help, our instructors are more than happy to help. On your first driving lesson, your driving instructor will spend time making sure you get to know one another, so you can feel relaxed and safe. Through this they can also tell the best way to teach you to drive and work out the best pace for you. Our lessons are not built on a schedule, so you never have to worry. Your lessons can be arranged to suit your timetable and we even work unsociable hours to make sure that our learners get the most out of their driving lessons in Pudsey. Our lessons are performed in fully insured and serviced Ford Fiestas. These small cars are responsive and perfect for learners, as they are light and reliable. The small body of the car allows maneuvers to be completed much more simply and with a diesel engine, this model is resilient to incorrect standing starts. For your first driving lesson at half price with OSM, make sure to contact us now. We will always go the extra mile to ensure you are happy with your lessons. For our prices, please click here. Our lessons can be arranged individually or for a 5 week period. If you are looking for driving lessons Pudsey, call Online School of Motoring today on 0798 965 2388 to arrange your first lesson at HALF PRICE, or fill in a FREE QUOTE form below.